Many different tones of lilac go together to make this misty and mysterious colour-scape. All the glass beads in this handcrafted unisex lanyard necklace have a matte frosted finish that ties the look together beautifully. I've added some 'Bali silver lookalike' pewter accents, a big split ring, and a clip to make the world's most versatile necklace. 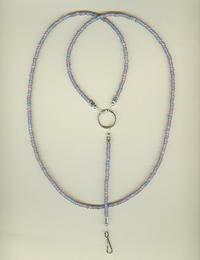 The necklace measures a comfortable 32", and the extender is about 6". A lovely mix of opaque, pearly and silvery clear, the beads in this lanyard necklace sparkle like icicles against fresh-fallen snow. This fashion necklace is as romantic as a kiss on a misty morning! Lovely opaque lepidolite rectangles, a soft heather colour, have been cut and polished to a velvety finish. The strand of clear rock crystal and unpolished lavender lepidolite set off this little hand-carved rock crystal Chinese god pendant perfectly.